The Galaxiidae, also known by the anglicised name as galaxiids, are a family of mostly small freshwater fish in the Southern Hemisphere. The majority of species live in Southern Australia or New Zealand, but some are found in South Africa, southern South America, Lord Howe Island, New Caledonia, and the Falkland Islands. One of the galaxiid species, the common galaxias (Galaxias maculatus), is probably the most widely naturally distributed freshwater fish in the Southern Hemisphere. They are coolwater species, found in temperate latitudes, with only one species known from subtropical habitats. Many specialise in living in cold, high-altitude upland rivers, streams, and lakes. Some galaxiids live in fresh water all their lives, but many have a partially marine lifecycle. In these cases, larvae are hatched in a river, but are washed downstream to the ocean, later returning to rivers as juveniles to complete their development to full adulthood. This pattern differs from that of salmon, which only return to fresh water to breed, and is described as amphidromous. Freshwater galaxiid species are gravely threatened by exotic salmonid species, particularly trout species, which prey upon galaxiids and compete with them for food. Exotic salmonids have been recklessly introduced to many different land masses (e.g. Australia, New Zealand), with no thought as to impacts on native fish, or attempts to preserve salmonid-free habitats for them. Numerous localised extinctions of galaxiid species have been caused by the introduction of exotic salmonids, and a number of freshwater galaxiid species are threatened with overall extinction by exotic salmonids. 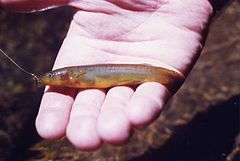 Twenty-two species of galaxiids have been discovered in New Zealand, and prior to the introduction of non-native species such as trout, they were the dominant freshwater fish family. Most of these live in fresh water all their lives. However, the larvae of five species of the Galaxias genus develop in the ocean, where they form part of the zooplankton and return to rivers and streams as juveniles (whitebait), where they develop and remain as adults. All Galaxias species found in New Zealand are endemic, except for Galaxias brevipinnis (koaro) and Galaxias maculatus (inanga). The juveniles of those galaxiids that develop in the ocean and then move into rivers for their adult lives are caught as whitebait while moving upstream and are much valued as a delicacy. Adult galaxiids may be caught for food, but they are generally not large. In some cases, their exploitation may be banned (e.g. New Zealand) unless available to indigenous tribes. In addition to serious impacts from exotic trout species, Australian adult galaxiids suffer a disregard from anglers for being "too small" and "not being trout". This is despite the fact that several Australian galaxiid species, though smallish, grow to a sufficient size to be catchable and readily take wet and dry flies, and that one of these species — the spotted galaxias — was keenly fished for in Australia before the introduction of exotic trout species. A handful of fly-fishing exponents in Australia are rediscovering the pleasure of catching (and releasing) these Australian native fish on ultralight fly-fishing tackle. 1 2 McDowall, R.M. (2006). "Crying wolf, crying foul, or crying shame: alien salmonids and a biodiversity crisis in the southern cool-temperate galaxioid fishes?". Rev Fish Biol Fisheries 16: 233–422. ↑ Froese, Rainer, and Daniel Pauly, eds. (2008). "Galaxiidae" in FishBase. December 2008 version. "New Zealand large galaxiid recovery plan, 2003-13: shortjaw kokopu, giant kokopu, banded kokopu, and koaro (Threatened Species Recovery Plan 55)" (PDF). Department of Conservation, Wellington, New Zealand. 2004. Retrieved 2007-09-05. "New Zealand non-migratory galaxiid fishes recovery plan (Threatened Species Recovery Plan 53)" (PDF). Department of Conservation, Wellington, New Zealand. 2004. Retrieved 2007-09-19. Wikimedia Commons has media related to Galaxiidae.